The Model 3, which went into production only several months ago is “designed to attain the highest safety ratings in every category, Model 3 achieves 220 miles of range while starting at only $35,000 before incentives," according to Tesla. Model 3 is smaller than Tesla's flagship Model S, simpler, more affordable electric car. Production of the Model 3 began in 2017, and some custom deliveries were made. Now, one can order a Model 3, and according to the Tesla website, can receive it by late 2018. It features seating for 5 adults, it takes 5.1 to 5.6 seconds to reach 60 miles per hour from zero, has a range of 220 to 310 miles, and one digital display. As it is with most of the new cars, issues come up with Model 3 as more owners report them on Youtube or on Facebook. Tesla is clearly paying close attention to the feedback they are getting on Model 3. In fact, today I read about a Tesla owner who went with two friends on separate occasions to their Model 3 delivery. The DS repeatedly asked them to let them know what they thought about the car. However, as with many new vehicles, the new model does not come without its problems. 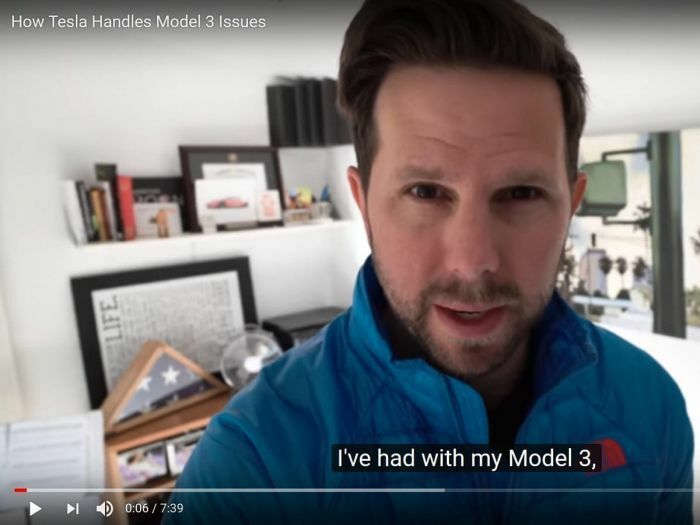 YouTuber Ben Sullins has spoken on his channel about problems he has faced with his Model 3 and Tesla’s response to his complaints. There were 3 main issues that he had to deal with in his car. The first one was screen phantom touches in the digital display. When he complained to Tesla, the company replaced the screen. He also heard some clicking noises on the flap of the phone charging port. Tesla responded by replacing the whole unit altogether. Finally, there were issues with the steering gear of the vehicle, and Tesla had called him several times promptly in order to fix this issue. Sullins states that, unlike other car companies which have terrible customer service, Tesla is completely different, and any issue he has had with any Tesla vehicle was resolved within a matter of days. If there are issues with software, for example, the car owner does not necessarily even need to go to the shop and have it serviced; the technician will come out to wherever the owner is, which ultimately saves money. Have you had any issues with your Model 3? If so, are you satisfied how Tesla handled them? What are your thoughts on the car company, their customer service, and their vehicles? Please let us know in the comments section below for discussion. I can’t compare Model 3's handling with Model S or X, but Tesla has been insanely responsive to me. I have received daily emails with reviews of video and pulled logs from Tesla. Solid feedback and tracking, and about 60% resolution already. Some people say Tesla is being proactive, but this isn't good for as these Model 3s are just the first few thousand vehicles off the line. However, the same observation could be argued in the opposite direction: It's better that this is the first few thousand vehicles since it allows them to work out kinks early on, impacting fewer cars and saving them problems later. Of course, we have no way of knowing how good or bad it is since we don't have the required insider information as to what causes all of their issues. It could be a persistent problem with company culture or it could just be the result of a young company setting up a new line. Wait till the warranty runs out and the owner is faced with fragile parts that cost a fortune (and only Tesla can fix) - check out reports of collision damage - which can only be repaired at "Tesla certified shops" aparently the only ones Tesla will ship parts to : $10,000 for a 3 MPH slight fender bender. Insurance company refused to pay that price. These are just two of the reasons I would never buy anything Tesla sells - that is one greedy company that produces ridiculously complicated EVs, which should always be simpler, easier to repair.